Ten million years of geologic history across the Cretaceous-Paleogene boundary in the Frontale quarry near Coldigioco (image credit: A. Montanari). Central Italy has been a cradle of geology for centuries. Since the beginning of the last century, the Triassic to Miocene carbonate succession exposed along the valleys of the Umbria and Marche Apennines of Italy has been a fertile playground for generations of earth scientists, particularly paleontologists, sedimentologists, stratigraphers, geophysicists, and structural geologists, from all over the world. It is in this geological theater that pioneering studies in the most disparate disciplines of the earth sciences have led to the understanding of novel principles and natural phenomena of the past, the development of new methodologies and experimental research approaches, and ultimately to discontinuities in scientific thinking, with the birth of concepts such as Event Stratigraphy, Integrated Stratigraphy, and Cyclostratigraphy applied to astronomical tuning, let alone Quaternary Geology, Neotectonics, and Speleogeology. The Umbria-Marche Apennines of northeastern Italy are a foreland fold-and-thrust belt, which was formed in the latest phase of the Alpine-Himalayan orogenesis. These mountains are entirely made of marine sedimentary rocks of the so-called Umbria-Marche Succession, which represents a continuous record of the geotectonic evolution of an epeiric sea from the Early Triassic to the Pleistocene. Studies of these rocks have promoted sensational discoveries, particularly about major events that have punctuated the history of Earth, such has the Cretaceous Oceanic Anoxic Events (OAE1 and OAE2), the Cretaceous-Paleogene (K-Pg) Boundary Event (with the global mass extinction caused by a catastrophic extraterrestrial impact), the events across the Eocene-Oligocene transition from a greenhouse to an icehouse world, and the Messinian Salinity Crisis of the Mediterranean, just to name the most famous ones. The objective of this conference is to present an updated vision of 250 million years of earth history as recorded in the sedimentary succession of the northern Apennine orogeny in central Italy. At the conference, besides keynote review presentations, original research works will be presented covering specific subjects of Tectonics and Structural Geology, Integrated Stratigraphy and Astronomical Tuning, Extraterrestrial Event Stratigraphy, and Quaternary Geology and Geo-Bio Speleology. These research works are either still in progress or they were accomplished but never published before, all with the support of the Geological Observatory of Coldigioco, an independent research and educational center, which was founded in an abandoned medieval hamlet near Apiro in 1992 by Alessandro Montanari, Walter Alvarez, and David Bice. Studies are now in progress about the recent tectono-seismic and structural history of the still active Umbria-Marche Apennines (as is exemplified by the recent seismic activity in 2016). More studies by international teams of stratigraphers are being conducted through long and continuous stretches of the Umbria-Marche sedimentary succession, focusing on the integration of bio-magneto-chemostratigraphy and radioisotopic geochronology with astronomical tuning via multiproxy cyclostratigraphic analysis. One of the primary results that have been derived from the Umbria-Marche sedimentary succession in the past 25 years with the support of the Geological Observatory of Coldigioco has been the development of the subject of the role that extraterrestrial events, such as meteoritic impacts, comet showers, and asteroidal breakups, had in the biologic, environmental, and climatic changes of planet Earth. Studies about this subject will be presented in this Penrose Conference. Last but not least are the tremendous advancements in the studies on the Pleistocene and Holocene history of this part of the world, which were focused on the extraordinary speleologic record of the Frasassi hypogenic cave complex (i.e., karstic geomorphology, slack water deposits, extremophile sulfidic ecosystems, speleo-archeology). Interdisciplinary studies by international teams of speleo-geologists, geochemists, radioisotopic and cosmogenic geochronologists, biologists, and archaeologists will be presented at the meeting. View of the town of Apiro in front of Monte San Vicino (image credit: C. Koeberl). An ice breaker reception will be held at the Hotel Tetto delle Marche in Cingoli (the main accommodation option, see below) on Sunday (September 24th) in the evening. On Saturday the 30th of September, an optional field trip to Monte Conero and Massignano (at extra cost) will be offered. The conference will be held in the historical Teatro Mestica in the medieval hilltop town of Apiro and the poster sessions will be set up in locales adjacent to the main theater auditorium. Lunch (included with the meeting fee) will be in a typical Italian restaurant in Apiro in walking distance from the “Teatro”. Coffee breaks and poster sessions will be held at the “Teatro” as well. The meeting is held in Apiro, a small town about 50 km inland from Ancona (a large port town on the Adriatic Sea), in the Marche Region. The closest airport is the Ancona Airport (code: AOI), which is served by several airlines from, e.g., Rome, Munich, London, or Brussels. Participants can also fly into, e.g., Rome or Bologna and then take a train to Iesi, the closest larger train station near Apiro or Cingoli. Car rental is also an option, especially for those wishing to stay at a B&B on their own (see below). Participants have to organize their own travel to/from the meeting. In case a larger group arrives at the same time at Ancona Airport or Iesi train station, a shuttle van could be organized (please contact the meeting organizers). It is recommended that participants arrive in Central Italy on Sunday, 24 September 2017; the ice-breaker reception is scheduled for the evening of that day. Please note that the Hotel Tetto della Marche is NOT available for bookings arriving earlier than Sunday, 24 September due to other events in the region. Participants will stay at the Hotel Tetto delle Marche in Cingoli (about 12 km from Apiro; half-board). There will be bus shuttling in the morning and in the late afternoon to-and-from the conference site in Apiro. The main meeting covers 5 days/6 nights at the hotel, with an option to extend by one night to participate in the optional field trip. Again, the hotel is not available before Sunday, 24 September. It is of utmost importance that all participants who want to stay at this hotel MUST have registered and paid no later than 4 August 2017, because immediately afterwards we have to release the block booking. For attendees arriving with their own means of transportation (e.g., their own cars, rental cars), accommodation at B&Bs in the immediate vicinity of Apiro is an option. Please note that participants staying at any of these places have to (a) have their own cars as no public transport or meeting shuttles are available, (b) make all their own arrangements, payments, and reservations directly with the accommodation place, and (c) are responsible for their own dinner arrangements (except on Friday); some of these places might offer dinner as well. The field trips will visit classic geological sites (such as at Gubbio, where the asteroid impact hypothesis at the K-Pg boundary started, or the Frasassi caves, which are the largest show caves in Italy) and thus are of great importance for the work that is discussed at the meeting. See the schedule above for the two field trips that are included with the meeting fee. An optional all day field trip to Massignano near Monte Conero, where the GSSP of the Eocene-Oligocene Boundary is located, will be held on Saturday, 30 September (extra cost). Field trips to Gubbio, Monte Conero, and Frasassi will be organized with tourist busses, using local companies. Please submit abstracts directly to the meeting conveners at: sandro.coldigioco@gmail.com. Please submit your abstracts no later than 25 August 2017, so that the abstract booklet can printed in time. Registration and payment of the meeting fee is required (by 4 August 2017) for abstract acceptance and scheduling. Length: preferably 1 page, possibly 2 pages (max), including references and figures. Please indicate if you prefer an oral presentation or a poster presentation. Normal oral presentations (plenty of slots available) will most likely be 15 minutes. Keynote presentations will be oral (25 minutes plus 5 minutes of discussion). Keynote presenters are also expected to submit an abstract. Posters should be 70 × 100 cm and if needed could be sent to the meeting organizers as a PDF file for local printing (at a minimal fee). A proceedings volume (GSA Special Paper) is planned; further information will be available at the meeting. Participants will have to commit to attending the full five days of the conference. Applications have been reviewed and everybody was notified. For any questions please contact the conveners at sandro.coldigioco@gmail.com. The normal registration fee covers hotel lodging (Hotel Tetto delle Marche in Cingoli, see above) for six nights (double occupancy), breakfast, lunch, dinner, and coffee breaks for five days, handouts, local transportation, and transportation for the field trips. Airfare is not included and participants must make their own travel arrangements. A reduced fee is available for those participants who have their own local transportation and accommodation arrangements. Through the generosity of our sponsors we are able to offer significantly reduced registration fees for students and, if needed, for a few other participants from low-income countries. Please note that GSA requires participants to submit field safety/code of conduct forms. Please also indicate if you have any special dietary requirements (e.g., vegetarian), as in Italy the choices are far more limited than in the US. The application deadline was 31 May; and registrations were due 31 July. 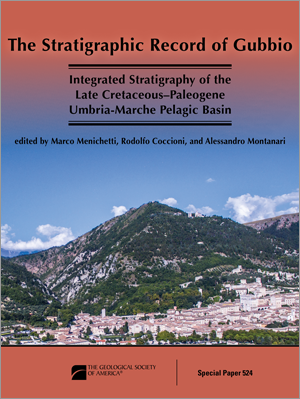 This GSA Special Paper provides a reappraisal of the geological and integrated stratigraphic research, which was carried out by scores of earth scientists in the gorges around the medieval city of Gubbio over the past fifty years. Order your copy now from the GSA Store.